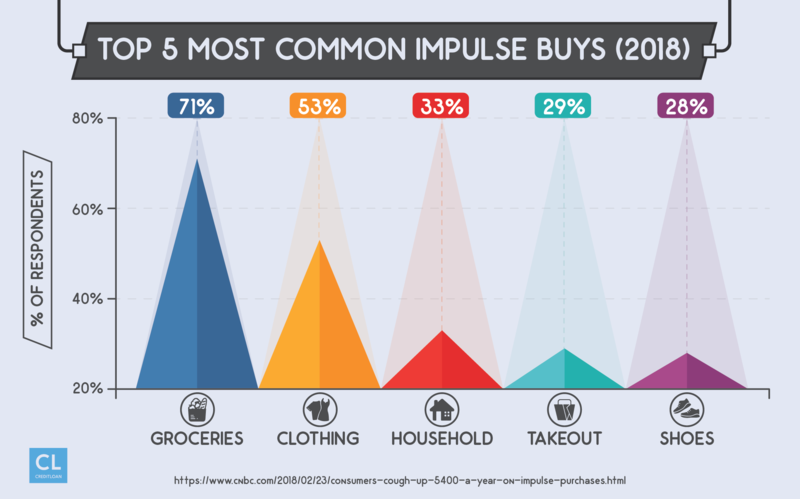 Impulse buying costs Americans thousands of dollars every year. Learn how to avoid unnecessary, spur-of-the-moment spending and save big money. The biggest problem with impulse purchases is that they often don't seem like a problem at all. However, there are people who have fallen into making big purchases on sheer impulse, and even small impulse expenses can add up fast. In fact, it can add up to around $5,000, which is how much the average American spends on impulse purchases every year. Small changes for a big result. Think about what you could do with an extra $5,000 every year! And even if you only spend a few hundred dollars on impulse purchases every year, that is still enough money to help you pay rent one month if ever you're strapped for cash. Know the psychology. Regularly giving in to impulse purchases doesn't mean that you're bad with money, it just means you're human. Our brains are hard-wired to crave immediate gratification and emotional spending satisfies that need. Unfortunately, everyone, from average Joes to millionaires, can find themselves broke if they don't take a thoughtful approach to their finances and their spending, in particular. 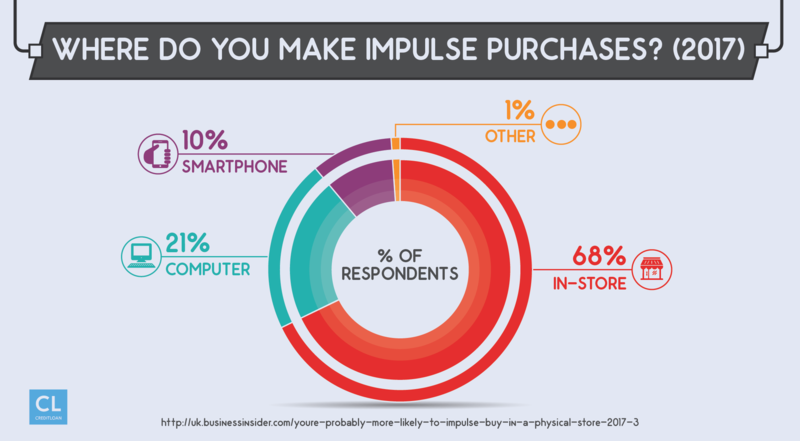 That's why I put together this guide on the science behind impulse purchases and strategies for controlling your spending. Whether you seriously need to get your emotional spending under control or you're just looking to save a few dollars, arming yourself with these facts and following these tips will help you accomplish a lot of your financial goals. Before going further, let's define what makes an impulse purchase different from other types of spending. Impulse purchases happen without planning, meaning you immediately make a decision to buy a product without prior thought or consideration. However, these decisions aren't unavoidable or unpreventable. You can control your spending. 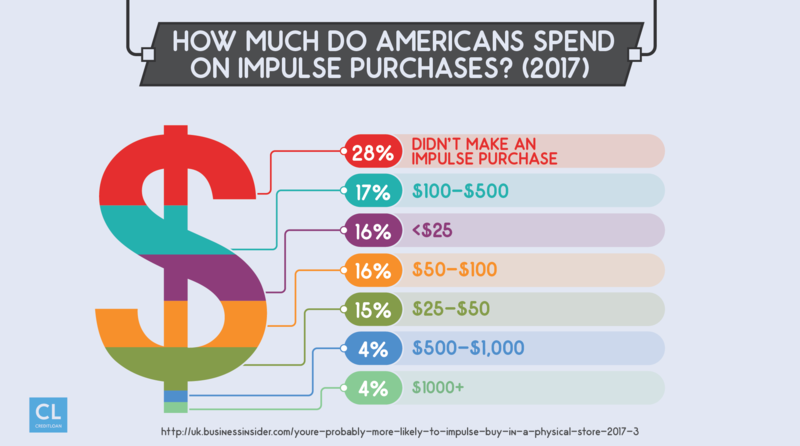 By knowing the circumstances and psychological drivers that lead to impulse purchases, you can monitor and control your behavior and spend less money. Cutting down on your spending is especially important if you're on a tight budget since not living within your means is one of the 10 biggest mistakes that can ruin your finances. Three main psychological factors. Emotional spending is usually driven by a need to feel in control, fear of missing out, and overestimating the necessity of a purchase. Spending money can be fun—too much fun. It feels great walking out of a store with a snazzy outfit or a new video game. What doesn't feel great is realizing you've gone over your budget when bills come due. Knowing why and how shopping makes you feel good can help you keep more money in your wallet. Purchases make you feel in control. Everyone has days when it feels like nothing's going your way. Maybe your car gets a flat tire, a friend suddenly cancels plans you made, or your beloved pet falls ill.
Studies have shown that going shopping during times like these can make you feel better. That's because shopping makes you feel more in control of your life and therefore happier, according to a study from the University of Michigan. If you're feeling down, consider avoiding the mall or online shopping until your mood improves. Not effective in the long run. Not everybody feels better after making an impulse purchase. One study found that 44.5% of people feel regret after spending their money on an emotionally-driven item. Loss aversion is a technical name for a simple concept. Whenever you feel like you may miss out on a deal if you don't purchase an item right then and there, that's loss aversion. No more FOMO. One of the biggest causes of loss aversion is the fear of missing out, or FOMO. While this term is usually used to refer to that feeling you get when seeing fun events on social media, not understanding how FOMO affects your finances could leave you tweeting about being #broke. If you see limited time offers or deals, that's playing on your FOMO. The seller wants to make you—the buyer—feel like you must make a purchase now, otherwise you risk losing the chance ever to. It's the reason why Amazon listings show when they only have a few items remaining in stock, so you feel motivated to buy one before they're gone. Letting FOMO dictate your buying decisions is one of the top five spending habits you should fix to get your budget under control. Think through purchases to avoid "biased evaluation of use"
Everyone generally thinks they're making the right decision whenever they buy something, even if that isn't the case. This is known as "biased evaluation of use". We tend to see only the good outcomes. We make purchases optimistically, thinking of only the best possible future scenarios we'll enjoy with our prospective new possessions. This tendency makes us purchase emotionally, without considering where things could go wrong. When I got sweet-talked into test-driving a shiny new import car, I suddenly got the idea to upgrade from the older, high mileage yet reliable ride. But did I NEED a new car? Visions of me tearing up the highway in the speedy imported sedan of my dreams were going through my head when I was signing the papers. What I wasn't thinking about was how speedy imported sedans require expensive imported parts whenever repairs are needed. Reality can hit hard. There's nothing like getting a bill for thousands of dollars to bring you back to reality, especially when I made all the repairs and did all the upkeep to my prior ride myself with a quick stop at the local auto parts store. Luckily, I came to my senses and traded the shiny import in for something more sensible, swearing I would think through all my big purchases a little more thoroughly in the future. People make poor choices when they're distracted, in a bad mood, or tired after a long day. Keeping your wallet firmly in your pocket when your mental resources feel depleted can help you save money. Less focused, more impulsive. A study in the Journal of Consumer Research showed how distractions can affect willpower. Study participants were asked to memorize either a two- or seven-digit number. They were then offered a piece of chocolate cake or a fruit salad. Those who needed to memorize the longer number were way more likely to opt for the chocolate cake rather than the healthier option because their minds were distracted. Pay attention to purchases. Just like how the distracted study participants picked the option that felt good in the moment, people may make impulse buys when their attention gets pulled in many directions at once. Retailers often try to take advantage of this by filling their stores with lots of displays, product demonstrations, and music. Keep this fact in mind the next time you're in a store to avoid walking out with more items than you intended on buying. Make sure to keep a major eye out in grocery stores, as up to 20% of the average household's grocery bill comes from items purchased on an impulse. Keep your emotions in check. Remember, your emotions can sometimes command your attention even more than whatever is happening in a store. Check your mood before going shopping, as it can be a big factor in whether or not you make an impulse buy. Emotional spending can happen to anyone, anywhere. However, research shows there are certain personality types and situations that are more likely to lend themselves to impulse buying. The convenience brought by online shopping means that making impulse purchases can be as easy as opening an app on your phone. However, this doesn't mean that there are more instances of emotional spending that occur online nowadays. An equal split. Consumers are basically making the same amount of impulse purchases online as they do in brick-and-mortar stores, according to a Nielsen study. That means you're just as likely to buy an unplanned item when browsing online store as you are when browsing store shelves. Researchers have looked at what internal factors drive impulse purchases and identified different personality traits that lead to emotional spending. Extroversion versus conscientiousness. Many studies have shown that impulse buyers share traits such as being extroverted, anxious, and status-focused. In general, those who struggle with stress or impulse control issues are also more likely to make impulse purchases. Many people may also find themselves making emotion-driven purchases to try and boost their social status, such as by purchasing a new sports car instead of the used sedan they had originally planned on buying. Naturally, just because you're an outgoing type of person doesn't mean you'll be an impulse buyer and vice versa. Having a feel for whether you're feeling particularly anxious or outgoing on certain days can help you decide whether it's a good day for you to get some shopping done. As for personality traits for non-impulse shoppers, they generally share the need to have a high degree of control over their environment. If you're looking to avoid living beyond your means and other money mistakes that impulse spending can bring, the following tips are your best bet. Try these strategies to cut down on impulse purchases. Don't shop when you're in a slump. If you do, you may end up spending money to try and feel better. Plan your purchases. Make a list before you go shopping and stick to purchasing only those items. Don't fall for checkout lane items. You're more likely to make purchases when you're distracted, and checkout lanes are prime distraction zones. The colorful displays and items are chosen based on what you're most likely to buy without thinking—so focus on paying for what you already have in your shopping cart. Wait, then buy. For expensive items, institute a mandatory waiting period before making purchases. For instance, say one day you suddenly found yourself wanting a brand-new 4K TV. Regardless of how much you want to get your wallet out at that moment, don't. Walk away and think it over for a few days. If you still want it after a week or two—and you have confirmed you have the funds to afford it—go ahead and buy it. However, oftentimes you'd be surprised at how many items you'll realize you don't actually need after giving them some thought. Focus on opportunity cost. A dollar spent on one purchase cannot be spent on a different item. Think about what you're giving up every time you're buying something. What other items am I giving up if I buy it? Could this ruin my budget? People are spending more money than ever on necessary expenses like healthcare and housing. You don't want to end up spending the money you need for a crucial mortgage payment on a frivolous impulse buy instead. Make a list. Keep an ongoing list of every impulse purchase you made and regretted—highlighting the most recent and the most painful ones. Put it somewhere where you'll see it regularly and let it remind you of your past mistakes to keep your spending under control. Don't browse for fun. It can be easy to use Amazon.com or other online shopping services to kill time while you're bored. Find other ways of occupying yourself instead. Online window shopping can turn into impulse shopping before you know it. Only carry cash. Credit cards make it easy to spend money you don't have on items you don't need. Try leaving your cards at home and only carrying cash next time you go shopping. That way, you have a hard, physical limit on how much you can spend. Know who to shop with. Peer pressure is a real thing. Some friends may tend to influence you to treat yourself and order that extra-expensive item at a restaurant, or buy that outfit you weren't so sure about. That sets you up to make an impulse buy. Know which of your friends encourage your emotionally-driven spending, and leave their company behind the next time you go shopping. Watch out for deals. This may seem counterintuitive, but be wary of coupons and sales when cutting down on your impulse shopping. These incentives can drive you to spend money on items because they seem like a good deal, even if you can't afford or don't actually need them. You can save thousands of dollars every year and avoid going into debt by taking a more thoughtful approach to your purchases. All it takes is knowing the psychology behind emotional spending and applying a few simple tips and tricks to avoid impulse buys. Fixing this and other bad spending habits is a vital part of taking control of your finances. Have you ever tried to cut down on your impulse purchases? What strategies worked for you and what didn't? Any great tips or cautionary tales to share with the rest of us?